New Market Grocery Stores in North Manchester, North Webster, Syracuse and Garrett came together to help create awareness for early detection through mobile mammography for a week in May leading up to Mother's Day weekend. The first-time "Melon UP!" raised a little over $3,500 through the sales of watermelon and direct donations.
" I think we accomplished several things: Created awareness for a fantastic cause, raised money for a great local charity organization, sold some watermelon, and created a foot print for future events," said Doug Knowles, New Market, North Manchester. " 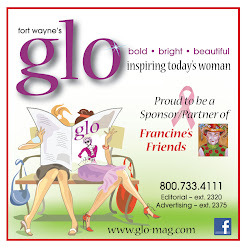 It has been a pleasure working with Francine’s Friends on this charitable event." "CHRobinson was a fantastic partner in helping with the donation of the watermelon, and SUPERVALU also partnered with New Market with a cash donation," Knowles continued. "We're just very proud of the group effort and help from all involved, including our produce managers and store associates. More importantly, is the relief and help the promotion will help bring to women in our communities." Watermelon provides a huge dose of antioxidants, about 80 percent of the daily vitamin C requirement, and 30 percent of vitamin A, or beta carotene. Watermelon also contains lycopene, the famous cancer-fighting substance found in tomatoes. Beginning on May 4th, New Market received $1 and $5 donations (names written on paper watermelon slices) at the cash registers. Donations were signed and posted prominently in four New Market stores. 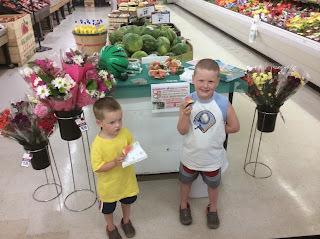 On 5/8 and 5/9, customers were offered a free watermelon with each $5 donation. In-store promotions included watermelon samples, carving demonstrations, an info table, and activities for kids.